Simon Navagaththegama once related a story about a radio. It was the first radio his village, Navagaththegama, had seen. It had amazed everyone. It had stopped working. Since it was the first such machine the repair industry had yet to be established. After much amateurish fiddling and a lot of ear-shattering crackling, it had come to life. Everyone had been thrilled and relieved, so much so that no one wanted to touch it again out of fear that the slightest move might kill it altogether. The station, therefore, was fixed for all time. It played Western classical music. Simon had used this anecdote to explain that art appreciation requires some minimum level of acquaintance and exposure. He loved Western classical music, he said. I suppose exposure and acquaintance are necessary but not sufficient. I was not lacking in either, thanks to a musically gifted mother and talented siblings. She tried hard, my mother did. She sent me for piano lessons for a couple of years, but we moved far away from the teacher’s residence and that movement ended that ‘exposure’. Somewhere down the line, she later told me, I had said I liked the violin. Thinking back I am pretty sure I might have meant that I liked the sound of the word ‘violin’ for I had not seen the instrument until she bought me a second-hand one. That’s how I encountered Aunty Eileen. 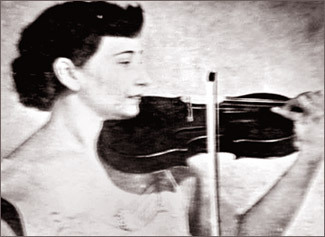 That’s Eileen Prins, violinist and teacher, feared then on account of the ‘talent-abysmality’ and adored later for the utterly non-threatening person who existed outside the class. It took me over 30 years to discover ‘adorable’, but as they say ‘better late than never’. I never became a connoisseur of Western classical music but if I do, someday, I’ll have to thank both my mother and Aunty Eileen. Of course there was also Mrs. Niles, who tried to teach me how to play the piano once Aunty Eileen recognized my limitations and gently sent me up School Lane (i.e. before Duplication Road broke it into two parts), but it was from Aunty Eileen that I got some sense of the basics. I remember my mother writing down a quote from ‘Merchant of Venice’ in the note book I had to take to class: ‘The man who hath no music in his heart is fit for treason, strategems and spoils’. Yes, literature interested me more than music. On the other hand, I still remember Aunty Eileen helping me remember the sharp key signatures using a mnemonic device, ‘Father Charles Goes Down and Ends Battle’, showing the number of sharps between one and seven for order of keys, F C G D A E B. I remember the reverse for the flat keys too: ‘Battle Ends And Down Goes Charles’ Father’ (B E A D G C F). The technical details, i.e. ‘theory’, were fascinating. When my mother passed away almost two years ago, Aunty Eileen’s son, Stephen, who had been my mother’s student at Royal College, came to pay his last respects. I hadn’t seen Stephen since the last time I had seen his mother, i.e. at the year-end concert held at a church on Jawatte Road. I was required to play ‘The Merry Widow Waltz’ and Stephen accompanied me on the piano. I was so bad that I was the only one who had not memorized the selected piece. Stephen said, kindly, after the performance, ‘it was a bit flat, but you were ok’. I remember being ready to run far away, because among the students was Lakshman Joseph De Saram, then barely 10 years old. I did run away and stayed away for 30 years. A few weeks after I met Stephen, later I went to see Aunty Eileen. She was already past 90 then. Like a doll. Beautiful. She was frail but lucid. We talked for a few minutes. I didn’t want to tire her. Aunty Eileen is no more. She passed away a couple of days ago. She was blessed with an exceptional gift and one she shared with many, many people. She was a teacher, so her music lives on and will continue to lift and enrich lives. This is the way of teachers and teaching. We forget to remember too often. She’s now unforgettable though. Perhaps because I am older now or because of a particular sequence of events and incidents I had no control over. Aunty Eileen gifted love and music. I am sure she’s being received right now with truly divine music. As for me, I think I will listen to some music. I am sure I’ll recognize the heart of Eileen Prins, even when the violins are silent.